Sylvia (Clarke) and Tony (Hale Hamilton) run a con that involves a fake pick pocketing and extortion from dopey department stores. Tony becomes aghast when it’s implied Sylvia might actually get a real job. Bigamy is a big factor in the film’s plot. Upon learning he’s been tricked, department store president Joe Smith (Bellamy) punches Sylvia in the face. Florida is where you can get the really good liquor. There’s nothing fancy in Parole Girl. It’s a simple, silly farce that kills 67 minutes– if you have free time to kill, this’ll get it. 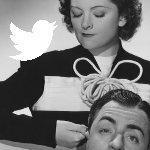 Sylvia (Clarke) is a good girl in a bad situation– is there ever any other kind in the early 30s? Her father has died, and, to repay a kind neighbor, she agrees to help him pull off a few cons. (He declares indignantly, “We’re not crooks! We don’t hold people up. We have a racket! It’s different.”) It works the first time, but the police are already onto them by the second go-around. Sylvia is pinched, and she begs for leniency from the store detective. 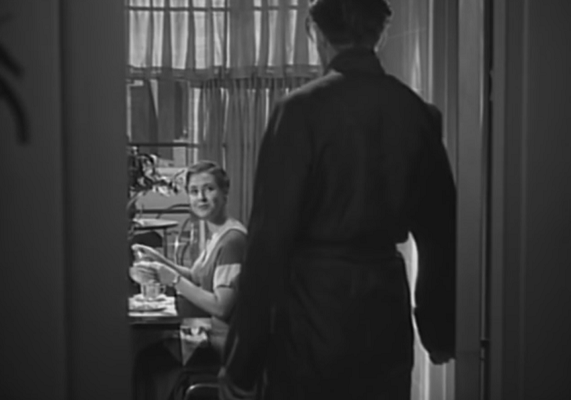 Out of kindness, he tries to get the store’s manager to let her off, but the man, Joe Smith (Bellamy), cuts him off and refuses to consider it. Sylvia vows revenge, first by way of a spectacular prison escape (involving fire!) and then a drunken night out with the unaware Smith. The next morning he enters his kitchen and finds Sylvia there, satisfyingly munching on a grapefruit (in a nice play on Clarke’s famous bit in The Public Enemy). She reveals that they’re now married (with a few ridiculous twists to boot), and Sylvia will gleefully be using their marriage to torture him. Sylvia’s still a softie, though, and things turn out okay. 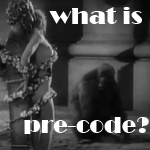 The film is a standard romantic fable, though very much a product of its era in designing its own moral universe. The conwoman who spitefully marries a man to make his life miserable is a good, honest woman. The reason that anything bad happens in the movie is that the villain initially shows no sympathy– it’s worse to be clinically cold hearted to a desperate person than to commit a crime. The cast is all fine, a number of B-listers getting a moment to shine. 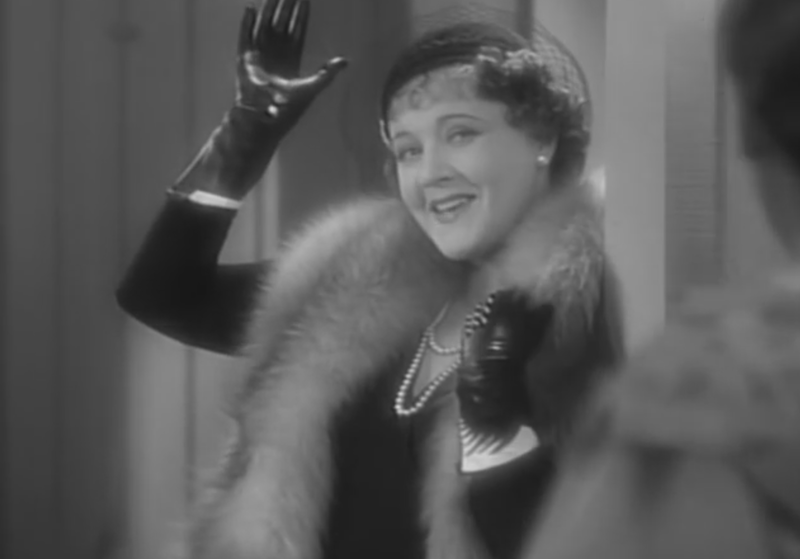 Mae Clarke’s evil laugh is amazing, and her ability to slip between sympathetic from maniacal to squishy is a treat to watch– she’s clearly relishing the opportunity. 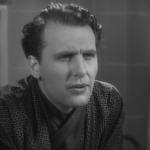 Ralph Bellamy is fine as a romantic lead, and Marie Prevost is hilarious as the amoral third point in a truly bizarre love triangle. Hale Hamilton (the moralizing brother from I am a Fugitive from a Chain Gang) is also fun as a sleazeball who’s eager to make Sylvia yet another wife of his. 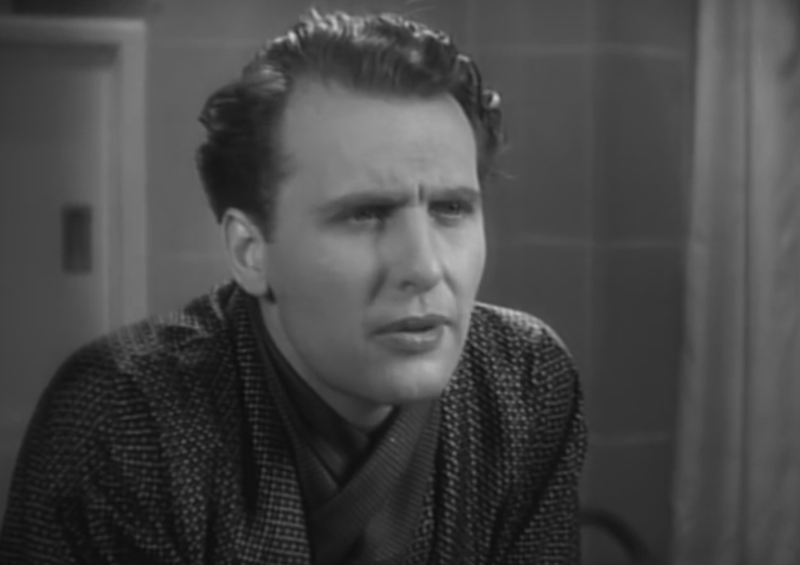 And, lastly, I have to mention Smith’s boss played by Ferdinand Gottschalk, who gets to be just as playfully amoral as the various con artists simply by ordering his employee to have a baby if he wants a promotion– oh, those were the days. Parole Girl is a competently made B-picture from the early 1930s. It’s definitely worth a look if you like the actors involved. It is rather dignifying “Parole Girl,” the present film at the Palace, to say that it is childish, for one can readily imagine that a youngster of 10 might easily pick holes in the story. Nevertheless, it was produced, which is more than one can say for many a really intelligent narrative, and, what is more, it succeeded in getting out of Hollywood, where it should have been kept, to a Broadway theatre. This stroke of luck is chiefly due to the fact that there is a great falling off in the attendance at cinemas during Holy Week. In Clarke’s autobiography, Featured Player, despite being one of the few movies where she’s the female lead, it barely gets a page mention, with most of it simply saying that Bellamy and director Kline were both nice people. Krasna started out doing publicity, but was so impressed by the film version of Ben Hecht and Charles MacArthur’s The Front Page (1931) he retyped the original script repeatedly until he felt he understood how to construct a play. He then had a minor Broadway success with Louder, Please, which led to a contract at Columbia, where Parole Girl was his third screenplay. 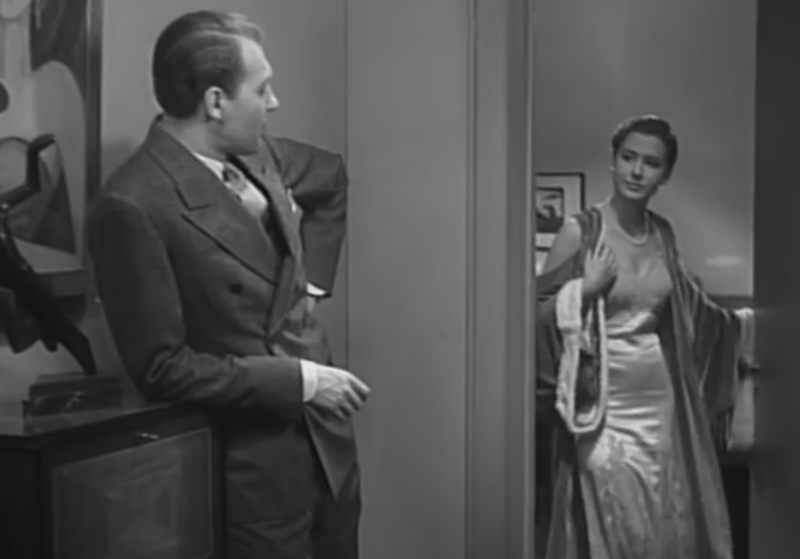 Perhaps it was coincidence or perhaps it was his unorthodox way of learning playwriting, but critics have pointed out more than a passing resemblance between this film and Bayard Veiller’s hit play Within the Law, which had been filmed three times by the time Krasna produced his script. The most famous version of the play was MGM’s 1930 Paid, starring Joan Crawford as a shop girl out for revenge after being wrongly sent to prison. 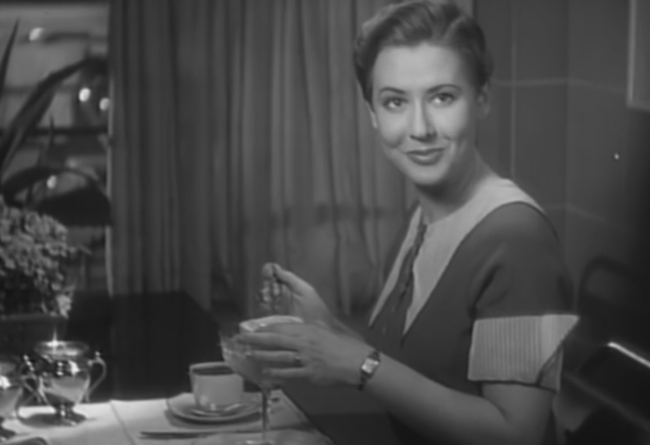 Fellow con Prevost (in a role similar to the one she would play in Parole Girl), gets her in with a blackmail ring, but Crawford’s ultimate goal is her former boss, whom she gets back at by marrying his son. 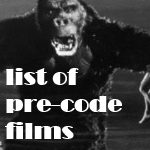 But, even in its ordinariness, it represents the perfect storm of Hollywood professionalism–there are no struggles with continuity, the screenplay (though relying on contrivances) is tidy and satisfying, and the cast is more than up to their collective task. Where it is exceptional is that it involves one of star Mae Clarke’s (sporting a stylishly short-cropped hairstyle) finest performances. She transitions from apologetic victim to vengeful harpy and finally back to sympathetic heroine with tremendous grace, finding the unifying trend of her character’s essential tragedy at each step. Perhaps her best moments are those in which she takes tremendous bliss in playing a domestic nightmare–she delights in manipulating her castrated husband and raiding his pockets for cash. What could have been a simple shrew becomes an unfulfilled housewife’s revenge fantasy: she’ll clean the apartment and fulfill her domestic duties, yes… but only when she feels like it! 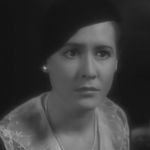 I remembering really enjoying Mae Clarke’s performance in this. It’s up there with Waterloo Bridge as a career highpoint. I don’t know if I’ve ever seen her in a role this ruthless… would’ve been nice to see her as a bonafide femme fatale! I agree, it’s a shame her career went south so fast. She would have killed in noir. She absolutely would have, Danny! 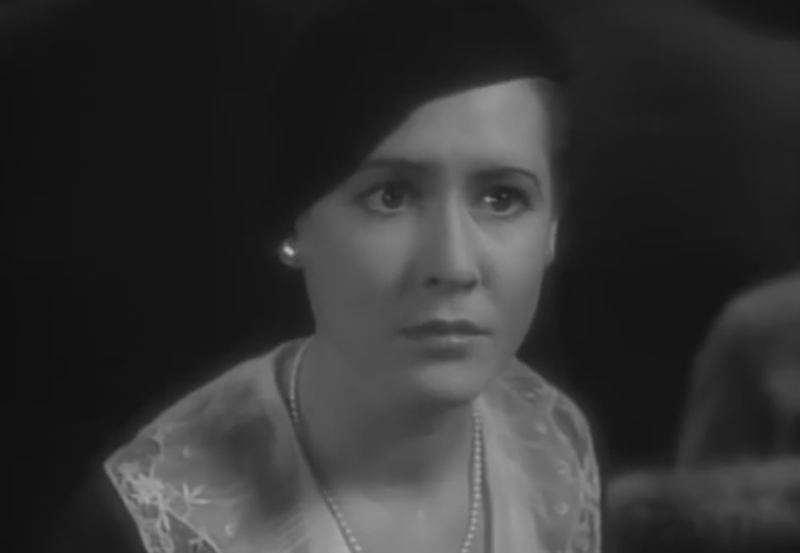 She had a great face (her look is decades ahead of its time) and a lot of emotional range, I think. I could see her in Gloria Graham sorts of roles, for instance. Long-time reader, first-time commenter: I just watched this, and it was a hoot! 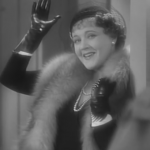 Thanks for your great blog, and thanks for shining the spotlight on Mae Clarke, who should have been a big star. I agree. And thanks for commenting!